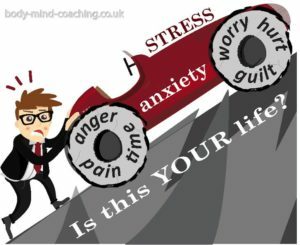 Is stress an issue for you? Stress might be the norm these days, but that doesn’t mean it’s normal nor that has to be that way. Is your life is like an up-hill battle and you feel a bit like the person in the picture? Feeling overwhelmed, depressed, anxious, nervous about something in particular? Do you get angry easily, find it difficult making decisions? Do you suffer with regular headaches, hot flushes, palpitations? If so you’re not alone. These can all be seen as signs of stress! It is agreed, by the medical profession, that stress is the cause or aggravates most diseases, yet they continue to treat the symptom not the cause. Some people think they relax by watching TV or having a drink. Others swear by having a massage, or a day at the spa. However the benefits don’t last more than a few days (if you are lucky). That is because it focusses the symptoms, not the cause. Nothing fundamental has changed in you after these actions. You keep repeating the same things that get you stressed in the first place. Einstein said “insanity is doing the same thing over and over again but expecting different results”. This is what I see happening with stress. May people focus on solving the stress and looking at all the things that cause it and how to change them. However this is part of the reason stress is on the increase, most of them can’t be changed in the way we would hope. Our attention is in the wrong place! We spend time and energy managing stress, not focussing on what the alternative would be. I suspect it’s because most people have no idea what to do instead – otherwise they would do it and stress would have disappeared by now. In my view there are 3 areas that need addressing that very rarely are. Understanding of how the brain works, not simply the principles of fight or flight with regards to stress. Developing a vision or sense of what we want instead of stress and new language that relates to it. Last but not least; have practical, easy ways to reach that feeling, that can be used in everyday life. Ones that don’t require outside intervention, like the massage I mentioned earlier. And they need to be more practical than sitting and chanting, which might not be suitable in the middle of an airport for example. What difference would it make to your life if you felt differently? 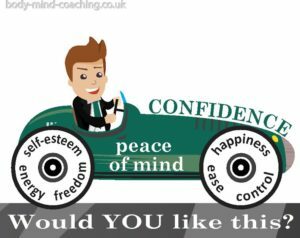 How would your life be if you were more confident, relaxed or clearer? Would you like to feel confident that you can handle whatever comes your way? If you don’t like the way you feel and you want to do something about it, join my next workshop. You will discover the 3 myths people believe about relaxation and what you can do about them. You will find out about the power of language and how your choice of words can help you get more of what you want. And understand what is needed to relax properly and practice how you can achieve that, wherever and whenever you want. This will mean you can unwind and really release the tension in your body, wherever and whenever you need it. Then you won’t have to wait for the next holiday to do so. This will make a huge difference to your stress levels. If you are interested in this event but can’t make the date sign up here to be kept up to date with the next one! Booking: Essential on eventbrite to avoid disappointment as places are limited. ← Tinnitus week, get help and support!